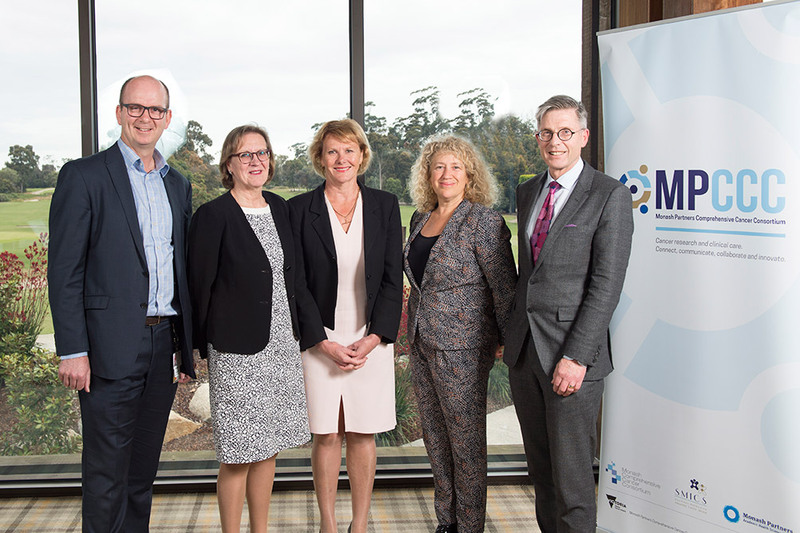 The Monash Partners Comprehensive Cancer Consortium (MPCCC) is a strategic alliance of health service and research organisations working in partnership to improve cancer outcomes through integrated, collaborative and innovative research, service improvement and clinical care programs. Collectively MPCCC partners care for over 19,000 cancer patients across south eastern Victoria each year, with around 80,000 episodes of care. Cancer services are comprehensive and incorporate state-of-the-art diagnostic, treatment, supportive care, palliative care and associated allied and community health services for patients across the cancer care continuum. Our research partners contribute major technology platforms in pharmaceutical sciences, bio-imaging, histology, proteomics, medical genomics and bio-informatics, and curate world-class disease registries to support cancer research discovery and innovation. MPCCC’s goal is to improve patient experience and outcomes across the cancer care continuum, through world-class research and quality improvement. This ambition will be realised by linking our expertise across basic, translational, clinical, health service, population health and epidemiological research with the service delivery expertise of our clinical partners.